2014 Literary Award. We are pleased to announce the recipients of this year's literary award are Jodie Jenkinson and Gael McGill for their article: "Using 3D Animation in Biology Education: Examining the Effects of Visual Complexity in the Representation of Dynamic Molecular Events"
Open Access. 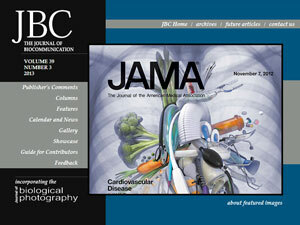 We are excited to announce that the JBC will soon be Open Access. Open Access means that scholarly articles published in the JBC will be freely available to read, download and share–and that means that the innovative research done by our contributors will get greater exposure, reaching not only members of the ABCD, AMI, and BCA, but potential collaborators in the scientific, educational, medical, business, and other communities with whom we work. We are continuing to work out the details, paying close attention to intellectual property rights and other issues that are important to our members. Stay tuned for updates!